Alaska Public Access TV, 1986. When I was a youngster in Kodiak I loved watching Bombshelter videos, hosted by Anchorage punk Bill Bored. Bomb shelter, airing from Alaska in 1984-1986, was a punk program shot from public access television in Anchorage by Frank Harlan who later also joined the Anchorage local punk band the Clyng-Onz. Harlan aka Bill Bored also ran the zine"Warning," a number of which I have collected in the last few years. In this video he is the one dressed as a metal head sitting in front of the tent. I became interested in Punk at about the age of 11-12 from hearing it around Kodiak. In the 70s and 80s the town of Kodiak held an "open port" allowing entrance of international people and items into the country without the sort of strict laws and fences one sees now at the Kodiak ferry dock. What this boiled down to for young punx and metal heads was access to all types of music! Bombshelter Videos allowed me to further explore the music I was hearing around my hometown. 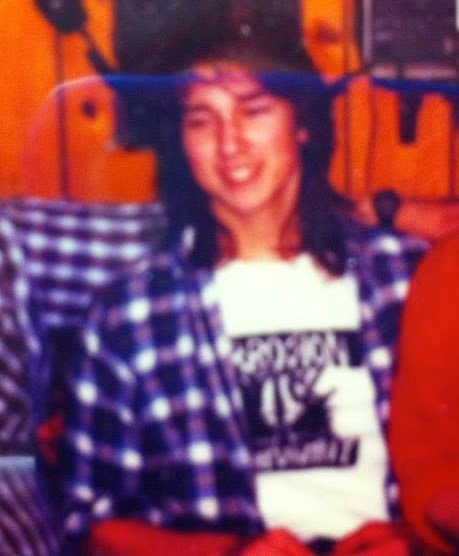 1986-ish, yours truly, upping the punx with a Corrosion of Conformity Eye-For-An-Eye T shirt. Later as a teenager circumstances required that I move northward from the Kodiak Archipelago to Alaska's largest city, Anchorage, the home of Bombshelter Videos. 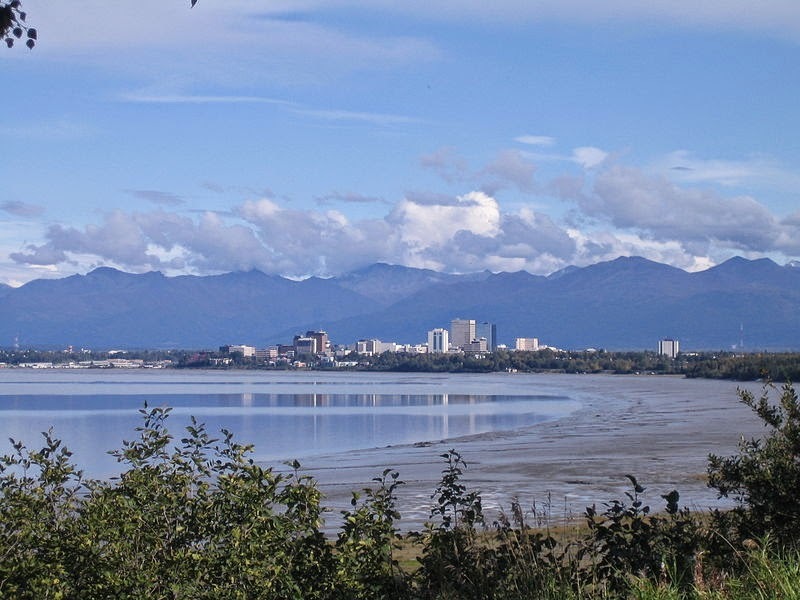 Anchorage sits on the south-central coast of the mainland and, as you can see in the photograph below, is lined by the beautiful Chugach mountain range on one side and the waters of the Cook Inlet on the other. Last May I was back in Anchorage on business and a friend lent me a bike, allowing me ride out along this shoreline on the Tony Knowles bike trail to Earthquake Park. This photograph was taken from around Earthquake Park. When I moved there in the 1980s the city held a thriving punk scene and there were two parks in the city's core that punx found imperative for meeting at as to congress with one another. An important one is behind the Egan Convention Center on 4th Avenue and E Street now known as the Elizabeth and Roy Peratrovich Park. The other is Resolution Park, named after one of the ships commanded by British explorer Captain James Cook. I still remember being fresh from Kodiak and skating for first time along the sidewalks of downtown Anchorage and coming upon these two places. 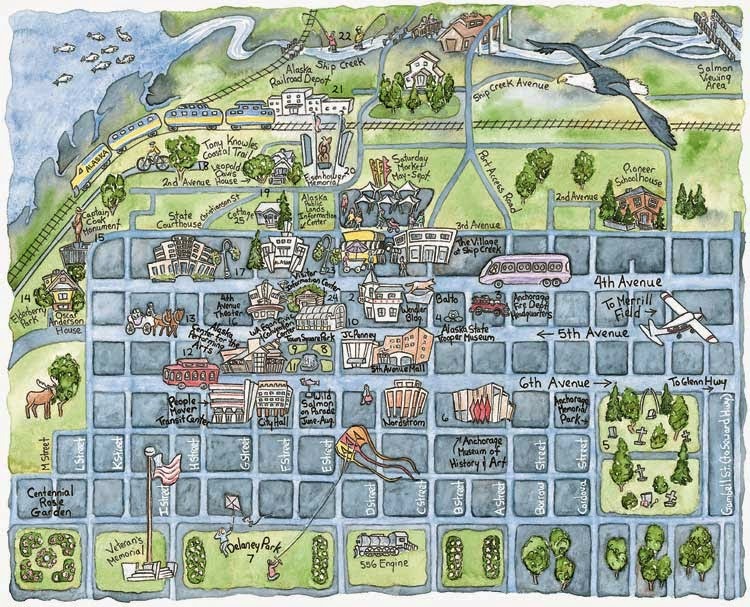 If you look straight up from "Delaney Park" (just above) to a drawing of a round building, you'd be seeing where Peratrovich Park Park sits in downtown Anchorage. If you look to the top left corner you'll see Resolution Park near the curve in the railroad tracks and the front of the train. 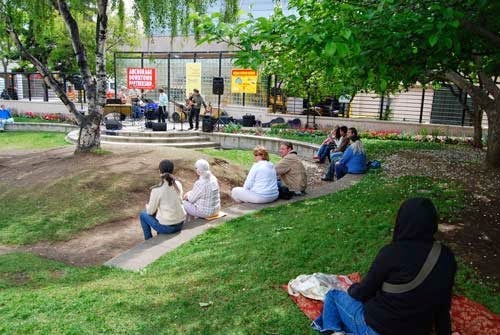 Peratrovich Park draws its name from 20th century activists Elizabeth and Roy Peratrovich, two Tlingit Alaska Native civil rights workers whom fought tirelessly to end discrimination against Native people throughout the then Alaska Territory. 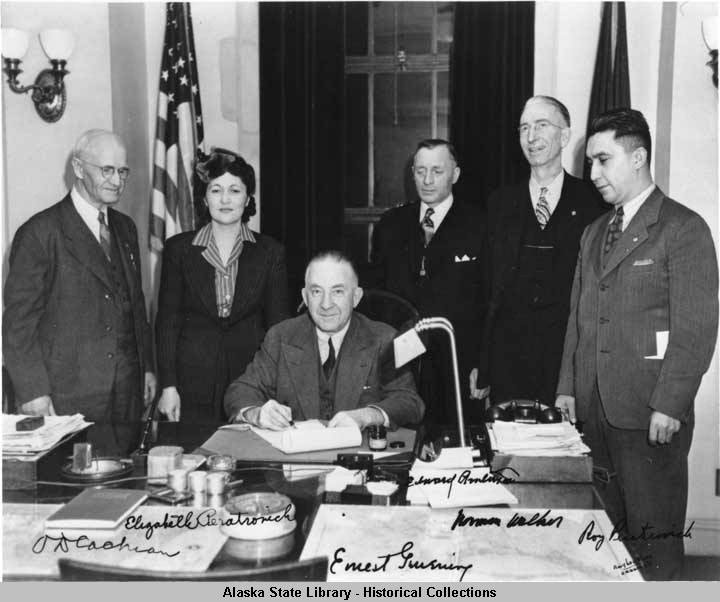 Elizabeth Peratrovich, was born and raised in Alaska and met where Roy, also Tlingit, at college in Bellingham, Washington. They returned home to Alaska and as a couple, they joined a territorial movement, to end segregational Jim Crow style practices. In 1945, their efforts paid off when the state legislature passed the Anti-Discrimination Act. From that point on businesses could no longer bar Natives from activities such as attending parks, watching films at theaters, or staying in hotels. The park in Anchorage stands as a way for residents and tourists alike to learn about this incredible history as well as a testament to their efforts. The photograph above of the Peratroviches with the then Governor Gruening and other officials at the signing of the law into reality. Peratrovich Park as it looks today. In the 1980s Peratrovich Park, at Fourth and E Street was still part of Old City Hall Park. Moreover, 30 years ago, during an statewide recession, the greenery was less bustling with tourists than with punx and homeless people. We punx called the place Tree of Eyes Park due to the fact that people had drawn eyes on the limbs of the park's trees. The first couple weeks I was in Anchorage I remember this non-Native punk handing out show flyers in front of the Egan Convention Center, just around the block from the park, when two West High varsity lettermen, who were Samoan, walked by on their way to an event at the Egan. He offered the flyer to them and one of them said, "No thank you" and they kept walking (as most people did and do when punx are handing out flyers). In response he yelled, "You probably can't read, anyway." I inferred his comment to be racially inflammatory toward their Polynesian descent. The teenagers stopped still, showing visible hurt in their eyes. They looked at each other and made their way back to the punk and one of them punched him in the face. As they walked away they left the racist punk with a bloody nose. At the time the incident seemed as if the punk was being a major jerk to two kids for no reason. I have wondered why anyone would think they could be explicitly racist toward two indigenous diasporic youth (who were both like a foot taller than him) and not suffer the repercussions? Looking back now I can see the connection between the passing of the Anti-discrimination Act in 1945 and actions of the punk who thought he could insult two high school students perhaps because they were non-white. The story now also helps me understand how changing laws doesn't mean that one can change people from having irrational feelings and expressing them so hurtfully. Nonetheless, the Tree of Eyes Park was a place I spent many hours conversing with friends. Another significant park for 80s Anchorage punx was Resolution Park at the edge of downtown, overlooking the Cook Inlet. 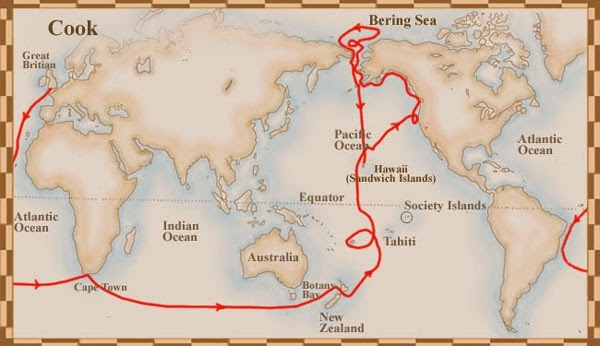 The site draws its title after one of the ships traveling under the command of Captain James Cook who on today July 12, in 1776 began a ill-fated journey when he sailed from England to places throughout the world. The map below lends detail to Cook's travels south around Africa, beneath Australia, north through the Pacific to run the Northwestern American shore to Alaska. After he passed through Alaskan waters Cook dodged south meeting with the Hawaiian Islands where he died. At Resolution Park, referred to as "the Monument," all kind of punx gathered often with tourists and homeless people to view on the body of water named after Cook himself, the Cook Inlet. The history of Cook and this area was written on a plaque beneath the Cook sculpture. My particular group of friends built a fort just off the left side of the overlook, called "Chudville," mainly because people called us "Chudfux" due to the lowly nature of our social status in the punk scene. Below is the official history of the "Cook" Inlet. The significance of Captain Cook's exploration and colonial intentions in/on Alaska was in small measure to my greater understanding of Russian history since I am from a group of islands with an enduring Russian colonial heritage. Unlike the Cook Inlet, Kodiak was not claimed by the British. As read in the photograph above, Cook and his crew, after locating this region, drew up ownership rights (with who?) "along with a few coins," and buried them in the ground of a place they named "Point Possession." All this British colonialism truly alluded me as a wayward Alutiiq punk. Russian officers with names like Shelikoff and Baranov adorn places in Kodiak. That was what I knew. With Nikpour's words in mind, my history with Resolution Park allows me to understand certain site-specific non-universal consequences of the Western project in the Americas. Punk itself, like this imperialism, transversed multiple places and communities with very particular results upon people and history that surely contradict the popular timeline of Punk. Following this line of thinking its really easy to see why I failed to grasp the colonial and imperial meanings memorialized at Resolution Park in the way I might with Kodiak's very own Shelikoff Lodge. The ability to work as a scholar lends me the great privilege to take apart common narratives from the archive up. And perhaps memorizing MDC lyrics when one is 12 years old drills into one's mind that hierarchies of thought and culture are meant to be questioned. Above is the song "Research and Destroy" by the Anchorage band Skate Death, from the record "You Break It, you Buy It," produced by none other than Frank in 1984. Still good stuff! Before the 1980s ended, Bill Bored relocated Bombshelter Videos to Seattle where he was able to continue his really interesting and inspiring work. "I LOVE ALASKA" The Psychedelic Skeletons on Turnagain Arm and 4th Ave circa 1985. We played Peratrovich Park for about 45 minutes before the cops shut us down. Fun times! Jason, that's an awesome story! Thank you for linking the clip! And the Skeletons rage! I spent a few weeks in Anchorage in the summer of '86, bumming around with some of the downtown punks. I remember hearing about Exhumed, and Psychedelic Skeletons. I remember a great summer district party at some big old house with a basement where we smashed beer bottles on the concrete. Fun times- so long ago. I eventually got work on a fish processor, and came back to Nor Cal. Thank you for the comment, Bobby! Yeah, wow. That was along time ago.